The law firm for Nicholas Sandmann, the Kentucky teenager who was slandered by numerous leftist mainstream news organizations in January, has now filed a $275 million defamation lawsuit against CNN. This suit is on top of a $250 million lawsuit the firm has also filed against the Washington Post. Right now it appears to me that both the Washington Post and CNN are going to lose big in these suits. Following the filing of the lawsuit against it the Post published “an editor’s note” concerning its coverage of the incident, but never admitted to or apologized for its false reporting. Instead, it merely noted the numerous errors and false claims in the original reporting. If anything, that correction makes it more liable, as it suggests the false coverage was acceptable to it, at the time. According to an article today by Hawaii’s local NPR station, it would be a bad idea to build a new spaceport there, based on the experience of Alaska residents near their own similar spaceport. This article could be the poster child for fake news. It very biased, indicating that this local NPR station has decided to join the campaign to block construction of the spaceport on the state’s Big Island. For example, despite a title (“Alaska Residents Urge Caution to Hawaiʻi Officials Considering Spaceport”) that implies strong opposition in Alaska to their spaceport, there is no evidence in the article to support that implication. The article only inteviews two Alaska residents, both of whom admit to being strong opponents of their own spaceport, from the beginning. This is hardly a fair sampling of local opinion, and certainly does not give us a good picture of the impact the spaceport has had in Alaska. This article’s bias is further compounded in that it only quotes one Hawaiian, a state senator who strongly opposes the proposed Hawaiian spaceport. While there might be strong opposition to both the Alaskan and Hawaiian spaceports, this article is not very convincing. If anything, it makes me skeptical, and suspicious that the entire opposition is a ginned up political campaign, of which this NPR station is now willingly participating. Modern journalism: CNN’s “Journalist of the year” for 2014 has been fired for fabricating stories by the German magazine Der Spiegel. …The reporter contributed around 60 articles to Der Spiegel, one of the leading German magazines for investigative reporting. He previously worked for other publications in Europe and won awards such as CNN Journalist of the Year in 2014. The fabricated articles include a phone interview with the parents of free agent NFL player Colin Kaepernick and a story about an American woman who claims to have volunteered to witness the executions of death row inmates. Relotius also drew the fury of locals in Fergus Falls, Minn., after spending three weeks in town and fabricating facts, characters and quotes from people in an effort to portray the town in a negative light. “What happened is beyond what I could have ever imagined: An article titled ‘Where they pray for Trump on Sundays,’ and endless pages of an insulting, if not hilarious, excuse for journalism,” wrote Michele Anderson and Jake Krohn who investigated Relotius’ Der Spiegel article about the town. Both Anderson and Krohn went on to reveal that the article doesn’t contain any truth except for the town’s population, the average temperature, and names of the businesses or public figures. Nearly everything else, including a coal plant employee named Neil Becker, who doesn’t actually exist, or quotes from a restaurant employee, who was falsely called the owner of a restaurant and whose son was given a fictional illness, was made up. It is clear from the above that this reporter’s fakery was designed to confirm the false narrative of our elitist intellectual society that believes that everyone in mid-America who might have voted for Trump is an idiot and a fool with the education of a turnip. No wonder CNN considered him a top journalist, since this is the same fakery I see repeatedly on that network. The article notes other similar cases of journalist corruption from the Washington Post, the New York Times, and the New Republic. The important historical context of these stories — besides that they all occurred at liberal outlets — is that they were once rare. When Janet Cooke was caught fabricating facts in 1981, she was almost a first. Such a thing had been unheard of in the top journalist world for literally decades. Previously, if you got a job at a place like the Washington Post it was because you knew how to do the job. Cooke indicated that this standard had failed, and it is clearly failing more and more routinely, at numerous so-called top liberal news outlets, in the subsequent years. Worse, this is only the tip of the iceberg. Trump’s accusations of fakery in the liberal press resonates with people because it contains a substantial element of truth. It also resonates because these liberal outlets have very obviously done nothing to correct their errors and false reporting. Bad reporters continue to work for them, even after they have been found to make egregious errors, including plagiarism. 48. May 28, 2018: The New York Times’ Magazine editor-in-chief Jake Silverstein and CNN’s Hadas Gold shared a story with photos of immigrant children in cages as if they were new photos taken under the Trump administration. The article and photos were actually taken in 2014 under the Obama administration. Even after it was clearly documented that the fenced facilities were established during the Obama administration and that the Trump administration was simply continuing Obama policy in this area, these news organizations actually ramped up their coverage to make it seem as if Trump was the person who created this policy. Liberals might wonder why Trump’s support remains strong, and rail against his crude attacks on the liberal press, but the bottom line remains: What he has been saying about the liberal press is largely true. They have stopped doing real reporting and have instead allowed their opposition to a Republican president to turn into blind hatred. Moreover, Trump’s crude attacks have been a response to the left’s own crudeness and dishonesty, something the left refuses to admit to. And until we see a introspective reassessment by the liberal press, the crude attacks from both sides are only going to get worse. The news yesterday that NASA will once again have to delay the launch of the James Webb Space Telescope due to a variety of technical issues and management errors not only exemplified the fundamental failure of the federal government, it also illustrated the routine failures of today’s mainstream press. First, Webb’s new delay epitomizes the systemic incompetence of Washington. Despite being 13 years behind schedule and costing eight times more than originally planned, NASA and its contractors still couldn’t get things right. Most of the problems have occurred with the spacecraft half of the project, which was built by Northrop Grumman in California and is undergoing testing there. During the teleconference, NASA officials, including acting Administrator Robert Lightfoot, expanded upon technical problems first reported publicly by the agency’s inspector general last month. These include leaky valves within the spacecraft’s propulsion system and difficulties encountered during deployment tests of the sun shield. Not only did the thin, five-layer sun shield snag during the deployment, but technicians also found seven tears up to 10cm long within the material. NASA and Northrop Grumman have identified fixes for these problems, but their repair has added months of delays to the project, and engineers cannot be sure that more issues will not crop up during further testing. Such failures, in NASA and in all big federal projects in recent years, are hardly news. Only the willfully blind or those who support wasting tax dollars to distribute pork will deny they exist. The failures of the federal government however is not the focus of this essay. Instead, the announcement yesterday and the coverage of it by the press provides us a perfect and very obvious signpost for differentiating between the fake news sources that are generally unreliable or too often allow their biases to influence their reporting, and those sources that do a good job. That signpost is one simple fact: Webb is not a replacement or successor to the Hubble Space Telescope, despite NASA making this false claim for decades. Hubble is an optical telescope. Webb will view the universe in the infrared. These are too entirely different things. Yet, too many news sources today repeated NASA’s false claim, illustrating how little they know about both telescopes and their design, while revealing their complete inability to do some basic journalistic research. Instead they merely rewrite old press releases, and thus prove clearly by their bad reporting why so many people have so little respect for the modern press. Link here. The author does an excellent job reviewing, in detail, how the mainstream Democratic media reported the Russian-Trump collusion story, from its inception before the election and since, and how all reporters involved, seemingly terrified of a Trump-Putin partnership, had had zero concerns about similar and actual Obama-Putin deal-making — often against the interests of the U.S. — during his entire administration. Essentially, we have two very bad scandals unfolding here. First and foremost, the previous president abused the power of his office to spy on his party’s opponent during the campaign, and used that information as a weapon during the campaign. Second and almost as significant, the press teamed up with that president to help him spy and attack that opponent, and is now working to squelch any mention of that abuse of power that they participated in. To put it mildly, the mainstream press has become an American version of the Soviet press when it was required to work for the communists or face prison. Here in the U.S. however there is no fear of prison. The press is doing this voluntarily. It is no longer looking for real scoops. It is only interested in advocating the election of Democrats. As a journalist this makes me more than ashamed. It completely disgusts me. Fake science: Two articles yesterday from the so-called science journals Nature and Science today illustrate once again how pervasive the corruption in the climate field has now spread to almost anything that relates to climate. On average, the bears needed nearly 12,325 kilocalories per day — 1.6 times more energy than previously thought. To meet such energy demands, a female bear on the spring sea ice should eat either one adult or 19 newborn ringed seals every 10 to 12 days, the scientists concluded. But nearly half of the bears didn’t catch enough food — and were forced to fast or scavenge carcasses. These animals lost 10% of their body mass over about 10 days. “That’s dramatic,” says physiologist John Whiteman at the University of New Mexico in Albuquerque. It’s as if a person weighing 80 kilograms shed 8 kilograms in just over a week, he says. Oh my god! The polar bears are dying! And global warming is killing them! What a joke. 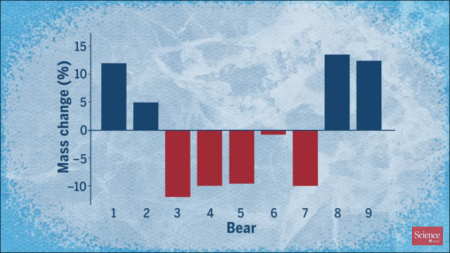 A quick look at the graph above, captured from the Science video, reveals that what the researchers really found is that four bears lost weight, four bears gained weight, and one stayed about the same. The bears studied weren’t “starving,” they represented what looks like an ordinary cross-section of population. Moreover, this study is incredibly uncertain in that it only studied 9 bears, and only during the spring months during three years. What happens during the rest of the year? What would happen if they studied a larger population? While the data here teaches us something about the polar bear’s diet, calorie intake and calorie requirements, it is absolutely insufficient to provide any conclusions about the future of the bear population. Worse, while both articles were quick to mention the threat from global warming, neither mentioned that the polar bear population continues to thrive, and has been doing so for the past decade, with no declines in almost all Arctic regions. Further compounding the bad reporting here, while both articles repeated their religious belief in global warming and the impending disappearance of the Arctic icecap, there remains zero evidence in all data gathered of the ice pack by satellites and ground research that the icecap is shrinking significantly. In fact, while it had shown a steady decline through the first decade of the 21st century, in the past few years there has been a marked recovery. While these scientists might want the ice cap to disappear for political reasons, it simply isn’t doing so. This is junk journalism and fake science. In fact, it is downright pitiful. That the reporting at such important science journals as these has become so slipshod speaks badly for the future of science in general. The world is faced with threats of nuclear and chemical attacks from North Korea. Iran is hit by protests that might escalate into all out civil war. Islamic terrorist attacks have now become almost routine. And in the U.S. there appears to be corruption at the highest levels of the FBI and the Department of Justice, while at the same time the federal government has produced a national debt exceeding $20 trillion, with more debt on the way. Have any of these significant stories been the primary focus of our American media, from either side of the political spectrum? An objective look at the culture of today’s press says no. Even as the leftist American mainstream media continues to focus its energies on petty and ineffective attacks of Donald Trump, too many journalists on the right unfortunately appear to be diving right in to join them with their own petty counter-attacks. The result is a press that spends the bulk of its time on irrelevant stories of partisan bickering that have little substance or importance. In the last week of 2017 we had one particularly acute example of this. First a mainstream liberal news source pushed an absurdly trivial story in a shallow effort to discredit Donald Trump. This was then followed by a frenzied and as-shallow response from the conservative press. I want to showcase both, not merely to illustrate how weak the original story was (which is obvious on its face), but to also point out the childishness of the response. I must add that everything written in every one of the news sources that I will cite below appears to be 100% accurate. My point here isn’t to highlight examples of error-filled news reporting — which these days mostly comes from left leaning sources overwhelmed by their blind hatred of Trump — but to illustrate reporting from both sides that hardly rises above the level of a five year old, and is thus completely inconsequential. From CNN: Truck blocks cameras from filming Trump on golf course. Apparently the day before CNN had managed, by peering through some bushes on the edge of the Trump International Golf Club in Florida, to videotape President Trump playing some golf. When they came back the next day a white truck now blocked their view. This then became a big scandal for CNN, with the cable network then spending gobs of time every hour for the next few days investigating the truck and following up on this terrible act of corruption, obviously part of the evil Trump administration’s effort to cancel the First Amendment and to silence the press! Much of the leftwing media piled on as well. Below are some of CNN’s coverage, as well as a bit of that liberal news pile on. Three stories today illustrate the importance of maintaining some skepticism when reading the claims of rocket companies. I could probably also include the story earlier today about the model rocket test launch that was hyped absurdly by the company and the British newspapers that reported it. In other words, the local official’s prediction was a bit overstated, and therefore should not be taken too seriously. The second story however can be taken a bit more seriously, since it is a report from an actual company official, Clay Mowry, Blue Origin’s vice president of sales, marketing and customer experience. He explains that they hope to resume New Shepard suborbital test flights before the end of the year, with manned test flights occurring in 2018. However, he says little about why there was such a long gap in New Shepard launches after they completed their last test flight in October 2016. At that time they said they would be doing more test flights in early 2017, but by the spring of 2017 had back tracked. The claim that they might be flying again before the end of the year, however, still carries weight, in that it matches earlier statements. In other words, Blue Origin has been very careful not to make promises it cannot meet. In rocket science this care cannot always be met, but they clearly have tried hard. This is why I take Mowry’s statement that they hope to fly humans on New Shepard in 2018 with some trust. The third story is a perfect example of how a company loses trust. Virgin Orbit is part of the Virgin set of companies run by Richard Branson, and used to be part of Virgin Galactic. Branson and Virgin Galactic have been making promises now for more than a decade, none of which have born fruit. This unreliability has made me very skeptical about anything they say, which is also why I do not report their claims much anymore. When they actually fly something I will write about it. For awhile I thought Virgin Orbit was a different bird, as the executives there have been more careful, only making cautious promises and then more or less fulfilling them. The story above however gives me pause. Even as they admit they have had to delay their test program their president still insists that they will be able to ramp up to two launches per month by 2020. Considering the fact that no single private company has yet managed to do such a thing, in the more than half century since the beginnings of the space age, I think it is a little dangerous for this guy to make this claim, even before the company has even launched its first rocket. Virgin Orbit might do it, but such wild claims make me very suspicious of them. And then there was today’s earlier story about Starchaser Industries. They launch a model rocket 4000 feet in the air, and from this they claim that they will be putting humans on a suborbital rocket in only two years. If you believe that, I have a bridge in Brooklyn I can sell you, cheap. The bottom line here is to use some common sense and thoughtful judgment in reading stories about future space achievements. The first three stories above are actually all well written, well researched, and very careful in how they report their stories. It however is not necessarily their job to tell you whether the claims are trustworthy, especially if the claims seem reasonable based upon the available information. The last however is an example of bad journalism, rewriting a press release without doing any research at all. In all cases, it is important to distinguish between stories about what is going to happen versus what is happening. I always prefer the latter, since a real achievement will always trump a mere prediction. And when it comes to the space industry and rocket science, predictions surely must take a back seat to reality. Update on Democratic IT scandal: Investigators now suspect that the computer staffers, hired by numerous Democratic legislators (most notably former party head Debbie Wasserman Schultz) and already indicted for bank fraud, might have stolen and sold sensitive data to hostile foreign governments. Investigators now suspect that sensitive US government data — possibly including classified information — could have been compromised and may have been sold to hostile foreign governments that could use it to blackmail members of Congress or even put their lives at risk. “This is a massive, massive scandal,” a senior US official familiar with the widening probe told The Post. Alarm bells went off in April 2016 when computer security officials in the House reported “irregularities” in computer equipment purchasing. An internal investigation revealed the theft of hundreds of thousands of dollars in government property, and evidence pointed to five IT staffers and the Democratic Congress members’ offices that employed them. The evidence was turned over to the House inspector general, who found so much “smoke” that she recommended a criminal probe, sources say. The case was turned over to Capitol Police in October. Wasserman Schultz is especially suspect here. While every other Democratic lawmaker fired these IT staffers months ago, Wasserman Schultz kept them on her payroll (though they had lost security clearance and could do no work for her) and has gone out of her way to hinder the investigations. Note that this is real scandal, involving actual indictments, the misuse of sensitive government data by foreign nationals of countries not friendly to the United States, and the possibly blackmailing of elected officials. Too bad our insane media today is trapped in a bubble and can no longer see a scoop, even when it is forced down their throats. This should be entertaining: A federal judge has ruled that the New York Times editorial writer who smeared Sarah Palin in an editorial will have to testify under oath about that editorial. The editorial tried to blame Palin for the 2011 Tucson mass shooting by an insane man, even though the New York Times’ own reporting had previously shown without doubt that no such link existed. In order to avoid losing their case, the editorial writer is going to have to claim that he doesn’t read his own newspaper, and thus did not know about the Times own reporting on this story. Otherwise, it will appear that the editorial was malicious and a lie, and thus libelous. Like I said, this should be entertaining. Either Palin wins the lawsuit hands down, or the New York Times will have to make itself look like a piece of junk. Which, by the way, it has mostly been for the past three decades. The network is reportedly looking for a seasoned author of thrilling fiction novels to fabricate news stories for its online and televised news coverage. It seems to me that this listing is the most honest I’ve ever seen. Though I’m not sure what difference it makes whether any applicants have a modern “journalism background” or not. Considering what they teach students about journalism in today’s modern colleges, there really isn’t much difference between journalism and fiction anyway. The White House has denied reports that they have decided not to move the U.S. embassy to Jerusalem, and have instead said that the decision on whether to move the embassy will only be made after Trump’s Middle East trip. Since neither story identified the White House official making the claims, either for or against the move, I suppose we should file this whole thing under fake news. These are unsubstantiated leaks, and should not be taken seriously. The uncertainty of science: New more carefully done research now proves that secondhand smoke from smoking does almost nothing to increase the risk of heart disease. In the early 2000s, as jurisdictions across the country fought over expanding smoking bans to bars and restaurants, anti-smoking advocates seized on the Helena study and related research showing that secondhand smoke exposure can affect coronary functions to promote fear of secondhand smoke. Groups across the country stated that “even half an hour of secondhand smoke exposure causes heart damage similar to that of habitual smokers.” Not to be outdone, the Association for Nonsmokers in Minnesota wrote in a press release that just 30 seconds of exposure could “make coronary artery function of non-smokers indistinguishable from smokers.” The message to nonsmokers was clear: The briefest exposure to secondhand smoke can kill you. A decade later, comprehensive smoking bans have proliferated globally. And now that the evidence has had time to accumulate, it’s also become clear that the extravagant promises made by anti-smoking groups—that implementing bans would bring about extraordinary improvements in cardiac health—never materialized. Newer, better studies with much larger sample sizes have found little to no correlation between smoking bans and short-term incidence of heart attacks, and certainly nothing remotely close to the 60 percent reduction that was claimed in Helena. The updated science debunks the alarmist fantasies that were used to sell smoking bans to the public, allowing for a more sober analysis suggesting that current restrictions on smoking are extreme from a risk-reduction standpoint. As almost always happens, the people pushing for the ban really weren’t that interested in protecting people’s health. They might have thought so, but in reality what they were really interested in was exerting their power over others, banning smoking and telling everyone else how to live their lives. Read the whole article. It is very damning, and illustrates again why it is very important to not pass laws quickly based on some preliminary scientific results. Care must be taken, and patience is required. The science is never clear right from the beginning, especially on complex issues like climate and the health effects involving large numbers of people. Real news: Six months ago the shipping company Hanjin went bankrupt, stranding its 96 container ships worldwide. This article takes a detailed look not only on what happened to those ships since, but also at the state of the entire shipping industry. There was a time when Hanjin’s collapse in August and this follow-up story would have been major news stories, covered by all the leading mainstream press outlets. No more. Even though it indicates significant financial and economic trends that should concern anyone who is serious about being an educated citizen, the press doesn’t cover it, and the public today really doesn’t care. Just another indicator that a new dark age is looming. It seems that the so-called clamp down on press releases and announcement by the Trump administration is not that unusual and is actually comparable to what was done when Obama took power. The memo at the USDA was especially routine, despite the reports. Similar news came out about a “gag order” for a small branch of the Department of Agriculture, which led to Buzzfeed to report “USDA Scientists Have Been Put On Lockdown Under Trump.” “Starting immediately and until further notice” the Agricultural Research Service “will not release any public-facing documents,” reads the memo obtained by Buzzfeed. The memo was rescinded Tuesday after a media firestorm. As much as I want such a clamp down, especially for those agencies that have become badly politicized, it does appear that the only thing happening here is a bit of panic by the left, by the media (I repeat myself), and by some federal workers. Essentially, they are squealing like pigs out of fear that they will no longer have their way, and the press is picking up the oinks and running with it. Why I don’t use Twitter: Researchers have discovered the existence of large networks of fake twitter accounts, some numbering in the hundreds of thousands. The largest network ties together more than 350,000 accounts and further work suggests others may be even bigger. UK researchers accidentally uncovered the lurking networks while probing Twitter to see how people use it. Some of the accounts have been used to fake follower numbers, send spam and boost interest in trending topics. What this story tells me is that almost everything you read from Twitter is not to be trusted. The squealing of pigs: In the kind of journalistic pro-government spending propaganda that I despise, the Salt Lake Tribune today published this article giving climate scientists in their local area a platform to lobby the public in favor of their NASA funding. The article provides a quick quote from a Trump campaign official noting their strong hostility to the politicization of climate research, and then spends the rest of the article allowing scientist after scientist to condemn that position and to defend that spending, repeatedly implying that should the NASA cuts go through, the research will end and even possibly that access to the data from NASA climate satellites will be denied to the public and to the scientists. At no time does the article provide any thoughtful information to explain that Trump administration perspective, which is based on some reasonable and very justifiable concerns. I note this article as a warning. Expect more of this very bad journalism. Most of the press are blindly liberal and Democratic Party partisans. They are going to work blindly with the climate community to help them defend their funding, without the slightest effort at objective reporting. The public should be aware of this, and see this political lobbying for what it is. In my daily scanning of the news, looking for stories that are both educational as well as entertaining, I came across this particular post: “WATCH – This Viral Video Perfectly Illustrates Why Americans Don’t Trust the Lamestream Media”. The title is typical click-bait, hinting at something truly revealing that nine times out of ten turns out to be immensely disappointing. This time, however, I found that the post revealed a lie about political polls, almost as an aside, that is simply never noted. The video itself is entertaining. It shows one particularly bad performance by a MSNBC political reporter, where in only about five minutes he used NBC polls to make a string of predictions about the presidential election, every single one of which turned out to be spectacularly wrong. I’ve embedded the video below the fold for your enjoyment. After all, these were NBC polls that Kornacki cited time and time again. Polls that showed Hillary Clinton leading Donald Trump in places like North Carolina, Georgia, and Ohio. The polls were terribly off-base. In some cases, the NBC numbers showed Clinton with a double-digit lead in states that she went on to lose. In other words, the polls were not by any means scientific, fair, or truthful. In the past decade or so political polls have routinely included what they call their “margin of error,” which generally for most polls ranges, as noted above, about three to four percent. This number is, and has always been a lie, however, as shown by the highlighted text. The real margin of error is the difference between what the poll predicted and what the actual results were. And for all of these NBC polls, the margin of error was not 3 to 4 percent, but anywhere from 11 to 30 percent! In other words, these polls were worthless. Worse, they suggest some intentional manipulation, as they all made their error in only one direction (against Trump and for Clinton), much like the tampered global temperature data that we see coming from NASA and NOAA. It could be that there is confirmation bias going on here, producing results these liberal news outlets wish, but I do not think so. NBC, and its sister station MSNBC, have repeatedly in the past five years committed some egregious journalist frauds, all of which designed to make conservatives and Republicans look bad and to promote the interests of the Democratic Party. The network has made no moves to correct the problems. Nor has it fired anyone. I think it very reasonable to suspect intentional fraud here, specifically aimed at helping the Democrats. More important, this story illustrates why we should all laugh uproariously the next time we see a mainstream media journalist note pompously that the poll he or she is citing has a margin of error of 3%. He or she either doesn’t know what they are talking about, or they know very well and think you are too stupid to notice. 1) pols made statements about a new policy to help it pass. 3) public discovered the policy was not as described. In a really bad way. 4) pols laughed at the public for believing them in the first place. 5) public learned its lesson, and acted accordingly. Media: remember who was cheerleading and protecting the politicians who were enacting ACA? Remember who was vilifying those making good faith arguments against it? Defaming them as racists? It was you. And we all remember being lied to by you, too. When you weren’t simply mocking us. And this is how you got Trump. The post ends with a few links to just a few of the Obama administration’s worst power grabs and fascist attacks on citizens, including the Gibson guitar raid and the IRS harassment, both of which the mainstream press either ignored or worked to embargo so that no one would know they happened. And these faked stories are all from the mainstream leftwing press, CBS, NBC, New York Times, Rolling Stone, Washington Post, New Republic, and MSNBC. The NBC corporation is an especially bad player here. Worse, their behavior has been specifically aimed at fueling a race war. In one case, they claimed that the Tea Party movement was made up of white racists and thus dangerous to blacks, and to prove it they showed an image of the rifle slung over the back of a Tea Party protester. The trouble was that they specifically framed the image to hide the fact that the protester was black. Then NBC deliberately edited the recording of George Zimmerman’s conversation with 911 to make him sound racist. It was a lie, as were all these stories. What makes NBC the worst is that they have made no effort to fix the problem. They not only haven’t punished or fired anyone, they keep doing it again and again. For this network or any of these mainstream leftist outlets to now complain about “fake news” is the height of absurdity. What they are really doing is trying to discredit alternative news sources that have actually been reporting the news better than them. They don’t like the competition, both financially and politically. As is usual, the bankrupt press didn’t do this work before the election, when it might have helped voters make their decisions. I tried to dig out some of this beforehand, and was somewhat successful, but I wish I could have seen lists like this prior to election day. The list is interesting in that it includes an incredible range of political positions. For example, the three names touted for Secretary of State, John Bolton, Senator Bob Corker, and Newt Gingrich, cover the full political range. Bolton would be a solid conservative hawk, as would Gingrich. Corker however was instrumental in making Obama’s bad Iran nuclear deal possible, and would end up more or less continuing Obama’s foreign policy at State. All three, however, have previously been mentioned as possible choices, so as of this moment we still do not know where Trump will be going in this area. I see the same political range in other positions as well. Even though the list leans heavily to the right, until Trump announces some appointments, we will not really know the direction his administration will take.